With its unique geography, wildlife, and people, the Forest of Dean has always set itself apart from the rest of the United Kingdom, but until now its websites had to share the .uk domain with the rest of the country. Not any more! 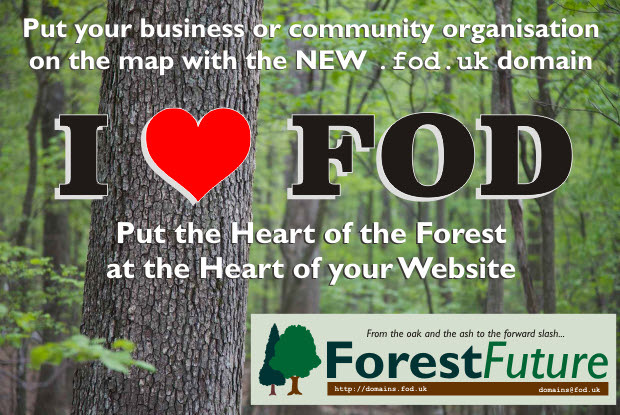 With the new .fod.uk domain you can put the heart of the Forest at the heart of your website. .fod.uk clearly tells consumers and customers where you are and that your content is relevant to them. .fod.uk offers the opportunity for a memorable and distinctive web address. A short, memorable .fod.uk web address appearing in search results will appeal to users and signpost local, relevant content. Every .fod.uk domain has the option to add a redirect from .rfod.uk (Royal Forest of Dean) and a personalisted shortcut URL http://fod.uk/yourname (subject to availability) at no extra charge. Upgrade your basic website by adding one of our exciting software packages such as a blog powered by WordPress or start an online shop powered by OpenCart! Standard Domain: £24 — any domain name that doesn't fall under the premium domains definitions below. 5-10 character single word: £48 — any single dictionary word of 5-10 characters in length. Personal Name: £48 — any combination in the format FirstnameSurname.fod.uk. Town or village name: £96 — any town or village name. Community groups, town councils etc. discounted to standard domain rate. 4-character domain: £96 — any combination of four characters (letters a-z, digits 0-9 and -). 3-character domain: £192 — any combination of three characters (letters a-z, digits 0-9 and -). 2-character domain: £384 — any combination of two characters (letters a-z, digits 0-9). 1-character domain: £768 — any single character (letters a-z, digits 0-9).